Poll: What is YOUR OTP? Location: Crashing this plane, for you. 1980. It is 1980 and the world sits perched on the knife-edge of sanity. Forces in the East and the West threaten to create a horror not witnessed since 1914. It's been seventy-two years since the onset of the Great War, the one which ended in so many maps redrawn, people moved, and boys bleeding in the trenches of France, Africa, and Asia. But, what you know of World War 1 is changed. There was no second for us, not yet anyways. No war where we may look back and distinguish conflicts by the title of a First or Second. Sporadic skirmishes is all we saw, in comparison to the grandeur of the Great War, The Franco-German war of 1971, The Ottoman expansion into Southern Italy; The Tibetan, Taiwanese, Philippines, Korean, Mongolian, Indo-Chinese, and East Russian Liberations by the Red Chinese machine; The North American Wars of 1970 and 1971, and Ethiopian imperial Expansionism in Africa. And the Great War? That was an eleven-year quagmire. Millions were killed in the stagnant front lines and countrysides stripped bear. The war ended in an armistice that did little more but shuffle territories and summon an end to the conflict. Europe may have licked clean the physical wounds, but the mental pain still bears its fruit, as it does all over the world. These outcomes have altered your world into ours. Rocketry is still an infant field. The splitting of the atom and the exploration of space is still a field seen only in late 19th century literature. Figures who would have brought our world to yours perished in the trenches or faced lives heavily changed. Notables like Adolf Hitler took bullets in the Austrian trenches fighting Russia. A timely withdrawal by the Russians brought about the death of Vladimir Lenin, Leon Trotsky, and Joseph Vissarionovich Stalin. The Nazis never came to be, and neither did their war machine. Russia was under the thumb of Imperial rule for another sixty years until its collapse at the end of a Finnish rifle one cold afternoon in the early winter of 1971. America, who never participated in the Great War, enjoyed a period of growth, but lacked a capable military. It was weak and was made a punching bag in the early 70's. It's a hardened dog now. In Africa, European Imperialism has collapsed under the boot of Ethiopia. Declaring all of Africa African, and heralding a pan-African constitution organizing it's nations similar to the likes of the Holy Roman Empire from centuries ago, it sought to bring the continent under its wing; in the process freeing (or claiming) colonies formerly owned by Belgium and England. Although relativity peacefully between the years 1925 and 1970, things look to change. The wounds are healing. Movements are being made on the chess-board and the ­ is being stirred. But don't mind me, I'm just an old man rambling. Well I can certainly name a few people who would absolutely love to see this again. Comrades, I welcome you to Precipice of War. This is a reboot of another Role-Play I ran. It was very successful in its run. But as of recent, it's died. It boasted a mighty powerful 111 pages, packed with international politics, war, and other alternate-history dramas. I would write the above longer, but in the following paragraphs it will be expanded on greatly. I'll be sure to throw in the original intro too. So, this is a political RP based in an alternate seventies (obviously). World War One (AKA �The Great War�) panned out very differently than our own. For a start, there was no clear victor. It was also a eleven year long debacle that showed nothing in the end. As with the medieval Role-Play Kings and Caliphs�, I expect literacy. There is a system in place for the passing of time and I expect all events to play out to that (except for battles and summits, which tend to play out really long). And when posting I expect to see clear narrative, appropriate dialog structure, and an attention to grammar. This literacy Nazi will not stand for anything less. Of course, exceptions are raised when interacting with others. There's a system of passing time in place. Vets to the RP will be familiar with this. It's through this that I hope to maintain a balance of story, fair development, construction, deployment, and combat in a calculatable and dated method. A month in this RP is equal to ten pages of posts (when set on the standard number of posts-per-page). Roleplayers are expected to conduct their buisness is a time that's realistic by this system and I ask that members take time to at least research precedent to provide a reasonable time-table. As noted above, I want to see detail. Story-written narrative, dialoge, and all of that. I feel that I am beyond the emotionless "Trains 100 snipers and builds a giant wall across the Gobi Desert" thing. Realistic use of resources, I want this. I don't want to see massive armored mobilizations if you don't have access or trade rates to the resources required to do this (oil, gas, etc). I'd like people to research the nations they're playing as to be familiar with what they can produce at home and where they get other resources they need (for example, countries like the Belarus no doubt get their gas from Central Russia, but now considering the condition of Russia (read the Respected Nations section) they're cut off from their oil supply, so may be suffering vast economic instability and unable to move any heavy armor). The same also applies to the population the nation may have at this time, as this can go into army size (in any non-industrialized nation the maximum amount of people they could have in their armed forces without causing instability is ten-percent). Due to technological inconsistancies, computers and rockets are still very primative. Computers are barely passed the massive, glorified calculators aboard battle-ships and rocketry is strictly short-ranged. Although this may become irrelevant in the future of this RP as certain nations pursue to the courses they have set. As such, given generous time and I'll allow for advancement in computational prowess and rocket/missle capabilities. But in doing so you'll be required to do it at a simaler rate to how it was done by the history books. So as noted above, find precedent for your project and utilize a time-table of a project simaler to yours. This generally means devoting several years worth of pages to develop. I do this merely to balance out having power-weapons on the world stage and giving ample time for a response, should anyone catch wind. Regarding nuclear weapons: they do not exist. Any programs to bring them into existence will take years. Years beyond the simple rocketry projects China commands, or the NWC's hunt for chemical weapons. There's no back-bone laid for this. Nothing. Einstein didn't dream it up yet, if he even existed at all. You may lay down the theories for it, but it will remain in the shadows until a situation comes up where a government finds it neccesary to invest a good trillion or so dollars to explore nuclear research, which is another several years. So no nukes, not at the start. Yes nukes maybe in the "far" future but not now. And certainly not by any random third-world nations who may hardly possess the capital and resources to do it realistically, or who never had that research on their agenda. As far as the RP's canon goes thus far, the world only has an extremly basic grasp on the atom. Sort of they know it's there, but not its function. Some things to keep in mind. Not enforced, but let these be known. Considering the period this RP takes place it makes it easy for other nations to catch word of your actions (if public). So it's hoped that should you go to war that other nations speak or act out to condemn or support you. But this doesn't always mean every player will join in on your war with Malta. We have our interests too. The ten percent rule. In a nation not fully industrialized/pre-industrial only ten percent of the population can be committed to military duties, or else you suffer instability on the economic and feeding front. From there, only ten percent of that may only see combat duty as the other 90% takes up logistical, support, and policing functions. This is the new-members sign up, as it appears with everything else down below. Second post also includes the application for non-state affiliated/individual play, but that's not important. Also the fact-sheet, which is secondary. Nation/Faction - If you're gonna play as Germany, enter Germany. See, that wasn't so hard. However, if you're going to play as a rebel/separatist faction, enter the name of your faction. For example, if you're playing as the made-up Liberation Army of Andalusia within Spain, put Liberation Army of Andalusia (Spain) to show that your faction is operating within Spain. You may also include more than one nation that your faction is operating within. Faction Type - If rebel or organization, fill this out. If not, just leave blank or remove all-toghether. Backstory/Bio - Here you can make up the history of your nation or faction after 1914 up to 1976. Include any wars or rebellions that may have taken place. It helps to actually know a bit about the country or region you're playing as/within so it might not hurt to learn a little about your country's history on the internet. God forbid you might learn something once in a while. Also, it's best to familiarize yourself with any of the respected nations in the region. Any other information you want to share should go here. And I want a long bit of writing here. Three to four paragraphs or more of information. If you're short, I'm stopping you there). Although not true nations, organizations could add to the political geography through their influence. Their presence could start, influence, or keep a war from happening, or add some relief for story purposes. These are largely for those who are not looking for a fight, but would like to interact with others on the world stage. Organizations of course can be effected by the law of the nations in which they operate in. So having these can encourage development of business or civil law to control them in some way. I'm opening up the ability to play as an individual person. This option is for those who don't want to have the responsibilities of an entire nation, organizations, or just want to have a side-lines effect on the politics of the world. As an individual you can play his/her life, whether it be a military career, pursuit and chasing of a scientific story-arch, or anything you can think of. You can help explore and detail a faction's culture and society by just RP'ing run of the mill life. So long as the players adhere to the laws of the nation they are in. Otherwise, they could find themselves being likely arrested by their home-nation. Ultimately, as the GM and the owner of a nation, I'd like to see this used to provide commentary on national and international events. As well as giving an area of internal politics a faction player may want to look at and build on. Also as playing as an individual, you have some freedoms to pursue the creation of a national or multinational business, or even lead a revolution/protest/riot/whatever to carve up the country you're playing in to suit your own goals. In this case, send me a message before hand so I'm forewarned (if not, I could jump on you for acting a little OP, I'd like to know what's going on so there's no miscommunications). Players playing as nations are still permitted to create individual characters to better explore themselves and to conduct any story arches they have running. But having someone that's not them playing inside of their borders is aimed to help encourage depth. It's hoped that a partnership between an individual player and the nation they're in (provided it's not NPC) is made so that they can play on the same page and the individual RP'er is not arrested off the bat for looking at a cop wrong. Although a nation may create individual agents at will, they can not create individuals separate from their faction. For example: I may create a spy or two and send them somewhere in the world, and then play through through them. But since they are tied to China, they're still using Chinese resources and carry the chance of being found out (unless proper steps are taken). So therefore, these individuals and agents are part of the Chinese faction. However, I am not permitted to create a French person on a whim which will be tied to France and use French resources. This is to prevent abuse and over-extending my power by tredding the god-modding line. I could theoretically send an agent to China, and have him live in France. But should someone play France, they may compete with me to remove the agent from French soil. Now, this is also as much a sequel as it is a reboot. It's been five-years since the previous installment which I hope would have many of the loose threads we had lying around when the RP died. As such, I'll also expect to see recognition of past events with credit given to appropriate nations or even characters (if individuals are named). This will help to preserve the story. This also means there are some nations with a respected history. Those going to play as those or around them will need to be versed in this. Adherence, recognition, and continuing to carry on their plans in their previous owner's absence is demanded. A respected nation is any nation who's rule in the international field has had a prolonged effect and they have done great deeds worth noting. How long they were in play also has a respect. A nation is also considered respected if there has been significant and prolonged interaction with them by any one of the respected nations. What has occurred here is considered canon. Also because a few of the vets from the original RP have come to this forum, many are on reserve for a couple weeks. If you are a returning vet who has been a part of this since its olden golden days speek up. Also, interaction with these nations are barred during the time they are reserved and un-played. I don't want anyone coming back to find their country taken over by some up-start who's yet to contribute to the political geography of the world. Egypt was once a proud and independent nation, but as recent as the seventies it has found itself a slave to a greater nation. Building tensions between them and the Ottomans to their north over the Suez Canal has left the Arabic nation occupied. Now, as opposed to Egyptian law and Egyptian personnel holding the country up, it is Turkish boots and Turkish law that hold the region. To make matters worse, the Ethiopians to the south have wrenched control of oil-rich Sudan from them. However, hope remains for Egypt. During the fighting the Sultan of Egypt made a successful flight from the country. To where, no one knows. While all the eyes were turned to hold off the Turks, a last-minute escape was made by the Sultan and his cabinet into the night. Neither the Ethiopian or Turkish armies found him and it's believed he's wandering the lands of Tunisia or Libya. Or seeking asylum in a neutral country re-plotting his return. Anyone who seeks to rule Egypt, starting with the Sultan engaging his next step in re-acquiring Egypt would be a fun way to go. Ethiopia, in its current form, has thrived with support from Europe, especially Germany'. During the Great War it was heavily armed and backed by the Germans, allowing the nation to spread into Somalia and a number of other smaller African colonies as a part of Germany's plan to remove their enemy's influence from the continent. Even after the war, the country enjoyed a strong partnership with the Germans, arming themselves with German weapons and studying in its and Austria's institutions. But Despite its German backing, it in no way considered itself a dog being led about on a leash. In 1959, Emperor Iyasu V passed away at the age of 64, leaving behind a legacy of military reform, and victories won in the name of the Central Powers in the Great War. Under him, non-Muslims were heavily repressed. The results of which created a powerful Muslim majority in the state. His son, Yohannes Iyasu, was rapidly proclaimed emperor to avoid any coup attempts by any of the rebellious nobles still within the country or other hiding in countries like England. Under Yohannes Iyasu Ethiopia pursued a policy of "opportunistic expansionism". With civil unrest high in the Congo against their Belgian overlords, the Ethiopian government sponsored a move in 1970 to help free the rebels of their Belgian masters. This move brought the Congo under Ethiopia's wing as a vassal, signing the Pan-African constitution they maintained a level of independence enjoyed by the states of the Holy Roman Empire years ago. Later in the 70's, the Ethiopian military would participate on a campaign against Egypt on the side of the Turks. This move brought Sudan under their direct control (later they were de-occupied and turned into a vassal state and member of the Pan-African Empire). Soon after they would join Persia and India in invading Saudi Arabia, claiming for themselves the Red Sea cost and all of Arabia's important religious institutions. In 1971 they supported and aided rebels in Botswana, helping them in over-throwing the British and gaining independence, but later that year the government assassinated the leaders of the Tswana rebellion and acquired the nation for their own. In addition, Ethiopia practiced its political influence by responding to the Finnish Wars and inviting all participating nations to a summit in their capital at Addis Abada. In attendance were the nations of China, Spain, England, Ukraine, the new Communist Finns, Cambodia, Laos, Vietnam, and the North Western Coalition. It was here that combined with a series of events in the war unfolding at that time that a resolution was struck. To prevent a potentially bloody war (or to just hold it off for a later date) the attending nations agreed to a resolution to split Finland in two. The south would be returned to the former Russian governor of Finland, the north would remain Communist and continue as a socialist state. Also during that year Ethiopia would participate in the trade conference in Canada and open trading opportunities with the Western World. With the promise of trade with Canada and other sealed, trade with China was just beginning. Humored by Yohannes Iyasu's comments on European colonialism and overjoyed with their stead-fast anti-colonialist program, China sent ambassadors who bargained for trade rights with Ethiopia during the Finnish Summit. In exchange for agricultural goods Ethiopia would be supplied with metals produced from within China. As the years dragged on into 1972, the attention of Ethiopia would go to Tswana, where the Ethiopian occupation was beginning to turn bloody. Unapproving of Ethiopia's occupation and seeing it as another move from a new master to oppress them, the Tswanians acted violently. Elements of the former Botswanan rebels fought against the Ethiopian army. The violence in Tswana continued to heat up in 1973 with more open violence towards Ethiopia coupled with civilian protests. Bloody fighting was not uncommon as Ethiopia clashed with anti-Ethiopian Botswanians. By the summer of that year the rebels were finally pushed from all major cities and for a time things seemed peaceful. By September though, a renewed effort by the rebels had been unrolled. By December of that year they had devastated Ethiopia's occupational forces. Meanwhile in Ethiopian Gaborone rebels had totally over-taken their occupiers and freed themselves from Ethiopia. In Ethiopia itself, the mass unrest on the fringes of the Empire was fueling a popular democratization movement. Although they were a Constitutional Monarchy, they were obviously not well represented. In 1974 the democratization exploded, representing Coptic Christians and non-Ethiopians. The fire burned hot enough and the Emperor was assassinated that year. In a state of panic, Yohannes Iyasu's son Sahle Yohannes was crowned emperor, fleeing to Austria shortly after for fear of sharing his fathers fate. Pressure in Tswana prompted the retreat of the Ethiopian army ending the Ethiopian-Botswanian war. In China meanwhile, the emperor's second son Yaqob Iyasu was put under greater watch (despite being considered an officer in the Chinese army). To respond to the instability and to protect their ambassadors, a hundred soldiers were dispatched to the Embassies and ensure their protection. The wires to the Ethiopian Embassy in Beijing were tapped to watch for potential pro-European sentiment and get a better picture of what's going on in Ethiopia. In the spring of 1974 Sahle was beginning to fear Chinese influence in the nation-wide unrest. In March he publicized his anti-Chinese sentiments and China responded by cutting off trade ties with the country. Sahle's incompetence in this matter sparks unrest amongst even pro-Imperialists and a movement begins to promote his younger brother, China-based Yaqob as emperor. In the summer Sahle met with German and English leaders. In exchange for support in his regime, he allowed them rights to Ethiopia's natural resources and oil reserves as well as corporate privileges on trade to and from the country. With an agreement struck, Sahle returns to Ethiopia, joined by troops belonging to his European supporters. Following this, General Hassan; Commander and Chief of the Ethiopian military, announced his distaste with Sahle and mounted an offensive against the emperor. Utilizing European support Sahle entered a guerrilla war with the experienced general. This war didn't help Sahle's cause, and the democratization movement chooses to follow Hassan's. By 1975 Hassan openly declared Sahle as a false emperor and denounced his European-supported throne. He declared Yaqob as the true Emperor. By March, China heard of the declaration and moved to show their support for Yaqob. They relieved many of the security measures and gave the perceived popular-emperor a mansion formerly owned by a pre-revolution Opium Baron on the Yangtze in the Hunan country-side. From here he was allowed to meet with intelligence officials to discuss the likelihood of Chinese intervention in Ethiopia, as well as connecting with supporters in Ethiopia. In July Hassan captured the city of Kinshasha, prompting Yaqob to publicly support the rebellion and applaud them for their efforts. Aided by the Chinese New People's Network the news is filmed and sent to Kinshasha. Afterwords Yaqob's efforts to prompt Chinese intervention grew more aggressive and he urged his hosts to more seriously consider the move. Sahle mounted a counter-siege on Kinshasha in September and puts the city under renewed siege, ultimately forcing Hassan back into the jungles by December. Respected Nations of the Americas. Now the Socialist States of America, the former USA had a troubled history in the early part of the decade, the events of which lead to the shocking election of a far-left leaning president. Thus bringing about sweeping reform. Anger had fueled this change-engine and brought the US to this rapid change in plan. Most of the reasons for this change can be traced to the Great War. Since its outbreak, the US never entered the conflict and maintained neutrality and a strict isolationist policy since then. As a result, it suffered with a weak military. Having never fought a civilized power in nearly seventy-years it was inexperienced in the art of modern war. Ill-equipped, poorly trained, it was due time that even its colonies would rebel. It first started with Florida in 1940, where a separatist movement was underway. Sparked by what they felt was government inability to care for their issues, and the shootings of civilians during protests Florida went into rebellion. After several years of combat, the Northern half of Florida would break away. The Floridians recognized Jason Dumhell as president, and not the president in DC. The truce between the Republic of Northern Florida and the US was shaky at best. The next territory of theirs to fall were the Philippines. Lead by nationalist guerillas American forces in the island nation were quickly driven out. Soon after the Chinese invaded to squash the nationalists and drive them to the southern island. During which, the US deployed soldiers in an attempt to reclaim the island. The Chinese and American forces met over Aurora where the US Air Force clashed with the NPLAF. Suffering heavy casualties, and being faced with a renewed threat to their homeland, the forces were summoned home, leaving the Philippines for good. As the US attempted to reclaim their island colony, the Canadians in the north made their move. Earlier that year the US government signed a deal with them allowing the Canadians to station troops along the US-RNF border to boost security. With the mobilization of US forces for the Philippines, Canada mounted their own attack on the US. The winter war of 1970-1971 was brutal for the United States. The Canadian advance was rapid and pinched from both sides they quickly lost land in the west, The Great Lakes, and New England. Spurred to desperation they pleaded with the RNF to aid them, and mid-way through the way the Floridian state mobilized their own soldiers to aid in the defense, removing Canadian troops from the south and claiming Georgia and the rest of Florida for their own (a move made early in the way when they were still enemies with the US). The front lines would come to a stand-still in St. Louis. For a moment, the strength of Canada seemed to falter when a separatist movement of their own rocked the Canadian political structure. The North-Western-Coalition, or NWC was a bloc of lumber and oil barons in British Colombia and Alberta. There was a withdrawal of soldiers as the NWC claimed ownership of these men. Soon, however, the NWC joined the war on Canada's side, having made a quick deal with them for independence. Also due to the war, China and Ethiopia made humanitarian moves to paint themselves a good picture of themselves. Mobilizing their resources, the two nations orchestrated independent refugee relief efforts saving a number of civilians by carting them back to their home country. Those who fled to Ethiopia found themselves stuck in Ghettos in coastal cities along the Horn of Africa and Red Sea. Those that fled to China were kept in a number of refugee camps on Taiwan or nearby Green Island, pending release back home (which wasn't done until late 1971). The war would damage the US economy even more, inflicting heavy damage on their already bruised economic infrastructure. The Canadian invasion burned forests and ruined crop-land, as well as leaving behind a lot of reconstruction bills. In the peace summit that ended the war, the US agreed to sign Alaska over to the Canadians. In exchange Canada would return all the land it had gained. Soon, the RNF would collapse leaving Florida empty. The war, now ended had left the people of the US very disgruntled over the inability of the US government to defend itself, and mad that the Canadians tried something. The popular catchphrase, "Blame Canada!" was born from this, and has been the slogan for the rising anti-Canada movement in the states. On the other-side of the coin, at least one attempt has been made on the president's life from the anti-government movement. Soon, a new power would take the office. Armed with the popular Anti-Canada banter, and promises of economic renewal, far-left candidate Marcus Fernandez took the lead in the polls. Very rapidly, he replaced the former president and immediately went to work. To prepare for the inevitable revival of the war, Fernandez reformed the army. Modernizing its training and re-arming the country to brace themselves. The mistakes made in the last war would not be made again. They will remain strong, and retake Alaska. Canada is a strange, ambitious country. Always moving to do big things, the most prominent of which being the war with the US. As stated in the history of the United States, Canada launched an invasion of the US upon the departure of troops to the Philippines. Utilizing troops stationed in Georgia and Alabama they launched an offensive north, while at the same time forces on the home front struck south and into Alaska. Their troops made massive gains in the offensive, taking over three-quarters of the United States before being stalled at St. Louis as they faced off against US and RNF forces. Mid-way through the conflict, oil and timber barons in the west utilized their power to both declare themselves independent from Canada. Fearing a second war that could strain their numbers, Canada quickly agreed to terms with the new NWC. With borders set and troops re-allocated they attempted to continue the war and push their way to DC. However their hand was forced once the NWC withdrew from the conflict citing concerns with conflict and wanting to be a "bastion of peace". With the withdrawal of troops, representatives from the US met with Canadian reps to negotiate terms. In exchange for the withdrawal of troops and the ending of the war Canada would keep Alaska. Basic requests. The two sides agreed and the fighting stopped and lands returned. After the war however, Canada was still dreaming big. Prior to the war, researchers were sent south to Antarctica to take atmospheric measurements. The data returned suggested that the high turbulence in the air was adequate to run wind turbines. These turbines fit with Canada's interests, especially if they could generate electricity. With that, they set about constructing turbines in the frigid Antarctic to harness the energy of the wind, but continuation, and ultimately completion hinged on one vital thing: a method to deliver the power generated north. A massive, two continent long cable was suggested. One that would run the length of South America, up through Central America, and into North America, ultimately ending in and distributing power throughout the Canadian nation. Meeting with the governments of South America they promised a share of the electricity generated to effected nations in exchange for allowing them to run the project through their lands. However, their diplomatic persuasions stopped short at the US. Here, still-heavy anti-Canadian sentiments bloomed like wild-flowers and the government wouldn't even hear them. It's become a certainly large diplomatic stumbling block. The completion of the power-line project hinges on acquiring US approval, if they can cut through the Canadian hatred present in both government and populace. But, now with even one war and ambitious project under their belt, both taking place over two-years they're still restless. In the winter of 1972 Canadian sponsored terrorism wrecked Greenland. Ultimately forcing the hand of the government in signing over the nation to Canada for protection. Canada has funds for a space-program, but it is tiny. Only catering to small-time of university astronomers. No attempts at going to the stars have been made, and no plans have been drawn up. Five years on, and Canada is still stalled in acquiring permission to build across America, now communist and strongly anti-Canada. Government-ran censuses of Alaska suggest that the reconstruction services have made bounds in popular opinion of Canada among the Alaskan natives. Despite loosing their oil fields to the NWC, over table-talks there's strong feelings that the supply can be made up for renewed cheap production of home-based oil. FEAR CANADA, THEY HAVE MOOSE! The NWC is a strange, confusing state. Despite claiming to be a nation pro-peace they fund heavily in weapons research and strongly encouraged the Finnish Wars. The government in a way is both very paranoid of the outside world (namely the US), and itself. The population responded to their war-like behaviors by rioting in 1971, only to face arrest and retaliation from the police and the NWC military. The weapons they produced were interpreted as being hypocritical, and a cruel irony. In a speech, the NWC president called the arrests and the creation of weapons as a move to foster peace, and to protect it. In the heat of the civil unrest unnamed terrorists attacked government buildings. The response by the government was considered very appropriate by the people and approval ratings went up as the state moved to arrest the culprits. It was during this that the unrest came to a close as the NWC government displayed just as the president had said they were preparing for. However, the approval ratings went down again as war was declared on Finland. It was believed that the NWC should have no interests in the region. Further damage was done during the sinking of their fleet at the hands of an unknown assailant, prompting them to withdraw from the war. Unrest lead to an attempt on president David Tan's life, prompting his resignation from office. His replacement - Tom Rans - was selected as a replacment. Although the corporate interests present in government saw fit to rig the election to put him in power. As far as the public is concerned, Tom Rans is a far more capable leader. He diverted funds from the NWC military and transfered it into infrastructure and welfare programs. Although little do the people know a sum of the diverted funds have been converted to military research. Esspecially in the search of new chemical weapons. Due to the cutting of the military budget the ground forces have been down-sized to accomodate. The military know largely relies on their NW-1 Hunter Killer jets and NW-2 attack helicopters to mount any kind of assault. Additional work has been put into the construction of new air-craft carriers to accomodate these craft and over the five-years Rans has been in power five have been built. The only true ally the NWC feels it has is Canada. No longer a playable faction, and long erased from the game, the RF deserves a place simply because of the role it has played in the politics of the game, even far after its violent departure. Since the 40's, the population of Florida - namely the north - has felt they were wronged by the US government. Lead by their charismatic leader Jason Duhmell they fought the law on the streets with their signs, and then on the field with their guns. As a unified force they drove the US out of northern-Florida, leaving only the southern tip as their last-holdings on the peninsula. Later on, in the 70's, that would fall in a sweeping move by the RNF. As a nation, it was also the only American state to join the Central Eurasian League, supporting the Turkish invasion of Egypt and to some extent Southern Russia. Should the CEL alliance have lasted to 1971, it and the RNF would have surely played a part in major events (but the alliance has long since decayed, more on that later). Shortly after acquiring freedom and standing themselves up right in the face of their former masters the ruling elite found they were lacking in vital metals to become a truly industrial nation. Looking around for a source of metals like iron their eyes fell on Cuba, and in the autumn on 1970 the Republic of Northern Florida lashed out at Cuba. Like a bear taking down a badger they dropped troops and special ops into the Cuban heartland, spurring months of brutal fighting across the Hispanic island. Ultimately, the badger would be killed at the bee turn out victorious, now a mighty wasp. Martial law was declared, rebels hunted, and the resources of the island used in the construction of ships and the most valuable thing to come out of the RNF. Seeking a way to one-up American F-15s, the RNF produced a plane that could both out maneuver and outgun the standard USAF jet-fighter. This would lead to the releasing onto the world in record time what they called the "Sukhoi". No one knows why it was called that. The RNF produced them in large numbers, becoming the number one distributer of the number one jet-fighter. Their customers included the likes of India and Ethiopia who bought the air-craft. Sukhoi's were stationed all across RNF territory and clashed briefly with US aircraft before turning their guns onto Canada. Late into 1970 however, their short, yet eventful life would end. Living the life of a mouse on speed they lived violently only to die violently. Animosity for the government took shape in the newly acquired lands of Georgia over the government's tolerance to black citizens. During a speech to the people, the entire RNF government was slain in a grenade blast, effectively plunging them into anarchy. Florida sat empty until 1973 when the US re-annexed it. Cuba would remain in a half-chaotic state until the local eastern communists swallowed it later that same year. All that remains of the RNF legacy likely sits in private shore-rooms and collection halls, their gear having become priceless artifacts that once belonged to the speed-demon of nations. More of their hardware still sits tended to in Ethiopia, or in the chop-shops of the Chinese military being re purposed and duplicated, their design concepts going into modernizing the country's air-force. What's left of the RNF are graves to fallen heroes in Jacksonville, a couple of monuments strewed with bullet holes, scared memories, disappearing relics and notes in the hands of mindful governments. An unintended outcome of the initial RNF invasion of Cuba was the Cuban Communist movement. Disinterested in rule from the north they fought their new masters, eventually being allowed land of their own on the east-side of the island. There was a recognition of the amount of violence the rebellion caused. Undoubtedly strained enough, the RNF never pursued that area heavily and unofficially recognized it as sovereign. Although shallowly inactive, the Cuban Communist Movement made great strides in the Caribbean. Aided by Chinese agents they successfully invaded and captured the island of Haiti, as well as receiving like-minded Cubans who had fled to China when they opened their doors to them during the RNF invasion. The land they acquired was also briefly important in the delivery of a wing of ex-RNF Sukhois stolen by Military-Anarchists at Jose Martini south of Havana by six Chinese agents. In later years, once things cooled in the Americas and disease-stricken west Cuba looked like a tempting target (weakening government control pre-RNF collapse and out-right collapse of the government lead to the spread of many diseases such as Malaria) the Communists of Cuba made their move. Pushing west they quickly reclaimed in-fighting weakened west-Cuba, reunifying the island for the first time in nearly three-years. After which they moved on what we know now as the Dominican Republic, and several smaller islands. This move making it more likely to refer to them as the The Communist States of the Caribbean rather than Cuba. With their claims made, the eyes of the Caribbean government have turned to their Hispanic brothers in Central-America, with Panama presenting a tasty target. Various regions in South America can be seen as equally appealing moves, but will surely lead to conflict or disapproval with Canada with Canadian interests invested there. A massive guerrilla on the stage of international stage, its size and strength masks its intentions. Other states are well to be cautious, as the entrance of China's five-million strong and loyal fighting force in the Theater of War is certain to change the game. However, it's interests have always been Asia-centered. Despite this, there has been a few moments when its body has shuffled to give its attention to affairs relevant to its image, or its honor. China is ran by a singular party, the communistic New People's China party. Founding of the party is placed in the early 60's. During this time, the end of Western support was coming for the Manchu emperor Aisin Gioro Puyi. Pressures from Japan and the resilient occupation of many of its Coastal-Chinese holdings combined with the usurping Republic of China movement had begun destabilizing the Emperor's government. Pressured on all sides, and facing hostility from the inside and outside its due to note things would spur the NPC movement into bloody action. In the summer of 1955, soldiers loyal to the emperor surrounded and gunned down student protestors in the city of Tianjin. The Tianjian massacre, as it was rightfully dubbed, spurred the Party into anger. Soon the call for arms was raised in their group, and the communes under their control grouped together under their enigmatic and young leader Hou Sai Tang (a law student from the University of Hong Kong). As the group's anger burned, they ushered in the Summer of the Ride Tide, a devastating and nation-spanning attack on anyone affiliated with the Empire, Japan, or those of the Republic of China who sought to stop them. Then national murder rate increased four-folds. The group coagulated more, organizing itself from a loose rabble into a solid force. Opposition through arms was met with a swift death. And they declared themselves the New People's China's Liberation Army; The NPCLA for short. Operating across the nation they began to take ground through guerrilla tactics in Japanese-held China, and Imperial in-land China. Their operations were marked with rapid success, prompting the retreat of the Japanese in 1957. By 1959, nearly the whole country was under their grip. The final punch came in Beijing. Well into the autumn of '59 the NPCLA had the last strong-hold of the Imperialist regime cornered; the Emperor's Palace, the Forbidden City. Several months of siege went by, with the fighting forces of the NPC more than willing to let the Emperor starve. It wasn't until the winter that the Chinese Communists decided they waited enough, and they stormed the compound. Several shots were fired, and the white-flag was raised. Sensing their down-fall the weakened Imperials surrendered to the New People's China Party. Their surrender marked the end of the Revolution and the government was handed over to the Hong-Kong law-student and his followers. Swift reform was made. Enacted the teachings of Vladimir Illyeach Lenin before he died, and Karl Marx. From here, China rapidly became very introverted, exiling all foreign ambassadors and tightly sealing their borders. During this time, China began work on mopping up the last faction to stand in their way: The Republic of China party. Several years of internal conflict had many of their men and leaders dead or in internment camps alongside Chinese Imperialists and the Emperor himself. Mongolia was annexed the mid-60's after a successful first for China's [military] Intelligence Bureau in weaponizing propaganda. Mass infrastructural repairs were made, looking to heal the scars left by the conflict as well as erasing Japanese, Imperial, and Republican thought via mass re-education. Many supplies were rationed, namely due to mass infrastructural loss and a powerful willingness to prove they are self sufficient. The spoils of war were acquired and rapidly put into reproduction and modification to suit the demands of China. The Heron Fighter/Bomber, Shandong Class Destroyer, the Tei Gui 1963, and others. By the 70's, China was growing more confident in itself. The Government felt that they had repaired themselves enough to act against remaining Western influence in the region, as well as reclaim one right-felt claim to China: Taiwan. In the summer of 1970 an underground campaign was put into play in Indochina. Agents acting on the behalf of the Intelligence Bureau smuggled themselves into French colonial-holdings in Vietnam and Laos to inspire revolution. At the same time the main army was publicly tested on Tibet. Although unkind geographically, much of the nation was chronically ill-equipped for the onslaught and within days the nation had surrendered to Chinese dominance. The Dalai Lama Tenzin Gyatso remorsefully agreed to surrender his home, before later fleeing from his summer palace to India or Nepal. In the winter of 1970 the New People's Liberation Navy as well as NPCLA ground-forces launched a million-strong attack on Taiwan in conjunction with the IB who had met with Korean Socialists hiding in China (led by Kim-Il Sung) to reclaim the Korean Peninsula. Splitting the attention of Japan, both the island of Taiwan and half of the Korean Peninsula was lost to China. From Taiwan, China responded to the potential threat in the Philippines by launching 90% of the million men in Taiwan on the island of Luzon and had fully acquired it by 1971. From here, an annual budget meeting in Beijing had prompted a willingness to stop military involvement now they had proved themselves, and turn their attentions to other projects. Five years later, and China has declared itself fully repaired. Charges of corruption, sedition, and operating a drug cartel were filed against minister Mao Zedung, and the Government had him and three-quarters of his ministry purged and executed. The Police and IB continue to work diligently to hunt down and eradicate Mao's Red Guard Gang, now believed to be the largest opium and heroine distributer this side of the Caspian. To replace him, Hou Sai Tang sought to forgive the former Emperor - who was declared formerly rehabilitated a month before - and enacted him as replacement minister of Agriculture. Until his death in 1974 Puyi - with approval from Hou and the Politburo (all ministries now submitting to account checks and project approval from Hou and the Poliburo) - began modernizing China's farms, seeking to put modern equipment into the hands of every farmer as well as research into more effective practices. He's been replaced by Xiang Chen as acting Minister of Agriculture. A long delay has also been lifted and some of China's war factories have been converted to the production of Civilian automobiles, long considered a rarity and a debated individual-commodity (some communes outright banning them except for government use, both federal and local). Repairs to China's roads and its construction of its infant high-ways were made and approved by People's Affairs minister Mang Xhu. The news remains strictly censored and megaphones in every city play government-sponsored and approved music and news through the waking hours. Chen Yaohang - a popular musician - has recieved notable airplay since the release of his album China Blue in 1973. The project of which has received heavy censorship attempts once leaders in the NPN had listened to the session tapes from the Green Island American Refugee camps. It was contested that this new sound and music would help spread party ideas (as the songs within sung about pride in the party and their life under it, but with an American blues twist). Begrudgingly, it was released in the masses where it received wide acclaim. The military is spear-heading some of the larger projects of China. During the campaign in Luzon, American ships intent on retaking their former colonies intervened sparking short conflict between China and the US. An air battle ensued between the aircraft of the New People's China's Liberation Air Force and the USAF (launching from aircraft carriers in the fleet). Several American F-15's where shot down and later picked up and sent to Beijing to be sent to the NPCLAF top-secret base Gobi 1. After dismantling some they reconstructed and examined the remainder. In the end, they had re-purposed American air-craft and sent in for production of the Urumqui 1, which is due to be the new standard heavy fighter by 1977. In addition, a tech-acquisition team was sent to former North Floridian holdings to steal ex-NFAF produced "Sukhois" and return them to China for reproduction. Making use of the rumored jet-streams, the pilots flew the craft from a gang of ex-NF military at Jose Marti airbase to friendly Haiti to refuel before launching into to skip on the Jet-stream to China. They're set to be the new standard in light-fighters by 1977 and many of the aircraft's technicalities have been bred into the Urumqui project. Also due to the condition of these crafts, the were able to be produced and distributed faster. Many officers will quip amusingly that the Chinese Sukhoi is already the standard in light pursuit and interception fighters, if not by 1976. The handling is noted as being smoother and more agile than existing interceptor aircraft. In the dockyards of Dailan the Navy has received approval to build five new Super-subs. Based on the design on the NPS Bohai (officially known as the CSI-401), the new revamped subs are aimed to being able to carry double the aircraft they can launch (from three to six) as well as increased run-way ability (keeping the hydraulic catapult of the Bohai with the addition of a launch ramp). These super-subs feature more muffled engines and enhanced pressurization and hulls, allowing them to dip lower than the Bohai. The NPCLAF - apart from the aircraft projects - also runs one of the most largest projects in the federal pocket-book. Prompting the release of millions of surplus CP-1960 Assault Rifles (the standard Chinese assault rifles) to their neighbors the Air-force aims to shoot into space. The result of study by Captain Henjibou an ambitious high-atmospheric bombardment project is under way. Aiming for the 100,000Km target, the airforce hopes to get a bombing aircraft well above radar and response ranges. This in turn, has led to many high-atmospheric research projects, starting with high-altitude balloons to study the composition (and confirm the existence of the Northern Jet-stream) of the higher reaches of the atmosphere (hitting the thirty-something kilometer mark). Follow ups were committed, before the first known satellite was launched. In 1973 the first space-born rocket was launched, getting China's "Orbital Atmosphere Research Platform" high above the Earth's atmosphere. Reaching heights of 200Km it relayed information on the composition, radiation, and pressure of extreme heights. It did so for fifteen days before the batteries died. Several months later an improved meteorological craft was launched (OARP 2, or Orb 2) which relayed information on altitudes as high as 250 km for a month before dieing. The project was referred to as "grounded goose" in English. The news was made public in the spring of 1974. By that point the IB had gotten wind and was chipping in to produce a larger satellite, built to function for far longer and to listen into radio-signals from space. "Project Kaanshou" officially, but was largely referred to as Project Blue. Launch date is scheduled for the late winter of '75. Based on feedback from the two satellite launches, the high-altitude bomber project has been delayed from 1975 to 1976 in order to look into safety issues. Vietnam's respected status comes from it being a member of the Asian Socialist Bloc, and as such an indirect territory of China when Non-Player Controlled. Vietnam's independence from France came during the 70's when China committed large numbers of agents to stir up civil unrest in the region. The north felt the brunt of China's influence as the first stopping point for Chinese agents traveling along the country's length. Connections were established with pro-independence factions and soon the Vietnamese Communist Party was founded with their northern neighbor's support lying in Jeng Chou Mihn. Fighting ensued with Colonial soldiers and police and within several months the north was so decidedly different it was looked at as being its own independent nation. During these events, France appeared to hold little interest and made no major moves in stopping the violence. Around this time Turkey reached out to try and control China, but soon found itself responsible for the many political refugees now living in South Vietnam. They agreed to stewardship over the rest of French Indochina in which they would work on evacuating pro-French figures out of the country and make way for the new Vietnam bearing down from the north. In exchange China agreed to hold back Vietnam and prevent further violence. By the winter of 1970/1971 Turkey had finished its evacuation (and soon after started the "Turkish Incident" in the South-East Pacific, more later) and Vietnamese forces moved in. Over the next few years Jeng Chou Mihn moved into Saigon, declaring the southern city the new capital and moving to impose government reforms as well as social and economic reforms simpler to that of China. The nation is ruled both by the President who acts as head-of-state and ratifies any laws moved up to him by the Vietnamese Politburo. The Politburo's privileges largely cover law-creation (and ratification if the president enacts his own law), party structure, as well as being a representation of Vietnamese Communes throughout the nation. The only legal party is the Vietnamese Communist Party (VCP). Because of its "young" status at the time and the bulk of its forces being committed to policing duties it was allowed to give minimal support during the Turkish Incident and the Korean Liberation Campaign. Laos's situation was much like Vietnam's. Chinese agents moved into French-controlled Laos and stirred up trouble, strengthening and forming pro-independence factions in the region. This ultimately lead to the creation of support for a single leader. Kaysone Phomvihane has since been the de-facto head of state and head of the Lao Socialist Democratic-Republican party. Another product of Chinese influence in Foreign Lands. Eastern Russia was born from the Russian-Mongolian Socialist Movement which marched for ethnic and economic equality for all races in Russia and economic equality for all classes. Headed by the militant Nikolov Nitski the group's influence spread over much of Eastern Russian and Eastern Siberia before claiming itself independent after the collapse of the Tsardom in the west, throwing the rest of the Russian lands into chaos and giving rise to handfuls of new pseudo-nations. The nation is ruled by Nikolov and his Politburo from the town of Chita. The location of which proved to be a strong logistics outpost when China was funneling weapons and supplies to their Northern ally to fight the Tsar. Since achieving independence, the Eastern Russians have moved to capture the West Siberian regions and have crippled oil fields in Komi via artillery fire and Chinese bombing raids. In 1974 a ground assault was launched which acquired the oil and gas fields in the territory ruled by the Russian Boyars in Komi, severely crippling their supplies as well as their ever-shifting allies in the west. A rather young state, it's had little time to set itself; its main concern being competition with the rest of the Russian states as well as Unification. Deals with China have allowed the Chinese NPN (National People's News) to operate within the area, allowing the Russians access to Chinese media. Basic reforms have been made in economics, turning all the formerly owned private manufacturing companies into publicly ran ones. As in China and the remainder of the ASB, government overseers see to the treatment of the workers under national code and make sure quotas are filled. Trade profits with foreign nations go to the state coffers to fund its expansionistic and infrastructural programs. Due to its station and current size of its army (largely from many of its new citizens not being loyal or numerous enough to take on the west) Eastern Russia is dependent on China as a crutch for its army. If you know Kim-Il Sung, you'll know North Korea isn't the most sane member of the ASB. Relations with Japan have been bumpy and despite China's treaty with Japan the North Koreans continue violence against the Japanese controlled South Korea. The North is rules ultimately by Kim-Il, no questions asked. Although looked upon as an important nation in the ASB, even wishes to be personally distant from Kim-Il Sung. The borders between the two Korea�s is awash with constant propaganda. As such, the Chinese Intelligence Bureau as taken to this region in its studies on weaponizing the psychological effects of words and images. Beyond this, its orders are to keep actual support to a minimum. There's whispers amongst the high ranks of the Chinese IB in ousting the current leadership in favorite of one more "stable". The violence on the border is as much a political stumbling block as the theft of the I-401 during the liberation of the Japanese-held Chinese coast. Of the whole ASB, Luzon is one of the odd nations. The Philippine State as we in our world know it was effectively broken in the Philippine campaign of 1970 when 90,000 Chinese soldiers, naval personnel, and the NPCLAF stormed the island in an effort to rip it from the hands of the in-fighting prone far-right (as far as China is concerned) nationalist forces on the island. The island is ruled from the traditional capital in Manila. And what makes it strange is the difference in religious tolerance in the nation's constitution. In 1971 the Chinese Politburo met several times on the issue of Philippine independence to try and reduce the feared cost of prolonged occupation and to flip the bill on someone else. However, based on data of the demographics of the island they hung up on one element: the heavy presence of the Roman Catholic church. Based on Houist principles they could not tolerate the church operating in the country and it must be removed. But in doing so, they risked upsetting nearly 90% of the population. Debate waged through the months until they settled on a conclusion. The Catholic Church would be allowed to stay, so long as the profits they made were directed to the Luzonian government. The churches themselves would effectively be public. To remain in operation the bishops must see that offerings made to the church are put into public programs within their See. An accurate ledger must be made of all expenditures and profits which the government reserves to look at once a year. Excess income can and will be removed from the church�s' accounts by the state. As part of its terms of independence, the Chinese maintain a large part of its occupational forces to ensure the independence of the nation and keep any foreign power from occupying it. As government popularity and Luzon's army increases the Chinese withdraw. The Chinese will remain in the area for 18 years (since 1971), the end of which in 1989 will see only a minimal force present, but the original force present would have all but left the nation. "1) The state of the new People's Socialist Republic of Luzon is to be made automatic and honorary member of the Asian Socialist Bloc by its protectorate [the] New People's China. In such the People's Socialist Republic of Luzon will have full trade rites within the bloc and will receive military, social, and economic aid by any of the members when called for and discussed. 2) The People's Socialist Republic of Luzon should maintain a mission to - in its life - capture the southern islands of Visayas and Mindanao. The first shots should at be fired - at most - 20 (twenty) years from now. 3) The People's Socialist Republic of Luzon will undergo gradual Chinese demilitarization running the course of 18 (eighteen) years. The rate of departure being equal to the rate of recruitment from the island's population as the government of the People's Socialist Republic of Luzon earns the loyalty of its people. 4) The People's Socialist Republic of Luzon will receive administrative freedom in respect to the members of the Asian Socialist Bloc. In that no two members shall declare war or cease trade with the rest of the bloc. The government shall not discriminate against citizens of the Bloc. If the People's Socialist Republic of Luzon fails to comply to the multi-national laws of the ASB then swift trial will be had against its president and government, resulting in the complete re-set or re-militarization of its government/territories. 5) The People's Socialist Republic of Luzon will be allowed to draft its own constitution following election of a president, politburo, and constitutional committee. This will need to comply with the provisions of its current occupier (China) for final ratification and will be processed for approval. 6) The issue of the Roman Catholic church will be decided by the Luzon government. In the event of it remaining the Catholic church will be recognized separate of the state and will not enter legislature and effect the process of executive decision. It will simply operate as a means to keep the people content and not infringe on local freedoms and their rite for living as they have done so for multiple generations. There for under Houist principle, they retain cultural identity and can preserve it. So long as older traditions are not threatened by growth of the Roman Church." Should events have happened like in our time-line, many millions would have died here. But as things went off without a shot, it did not. With Prince Sihanouk signing into an agreement with China, he effectively signed out any Western forces that would have seen a more conservative leader oust him from power. With his support in the Chinese to the north he oversees another oddity in the Asian Socialist Bloc. His reign has also been extended. More pro-Chinese than French, Prince Sihanouk supplies China with what his nation can afford, as well being additional muscle for the Bloc. His policies do not lean as far left as the rest of the members of the bloc and he allows several enterprises to remain private (although with some government investment, allowing for some pull from the state). The Cambodian news outlet, the Khmer Post operates as it did before they signed onto the ASB and maintains contacts throughout the world. The NPN often refers to them, and publicly credits them to broadcast news on worldly affairs. During the Turkish Incident Cambodia allocated several ships to stand watch over important passes from the South-East Pacific to the Indian Ocean. The Indians once sought freedom from the British, and in the forties they got it. The campaigns of Gandhi had seen a peaceful transition from colonial-prize to independent state. Now, with the little man in the robes now dead, the nation is shattered. The former government of India was expansionist, forgetting the preachings of peace from Ghandi G so many years ago. They claimed Sri Lanka in the winter of 1970 and soon after the heart of Saudi Arabia during the Persian-Arabian war (joining of course Persia and Ethiopia in the conflict). But instability within its military and government soon saw the end of the Indian state. A swift move saw the entire Indian government dead. Two short weeks had elements in the nation's military ousting the country from the parliament. And soon after, they ousted themselves. The atmosphere thus created was anarchic and chaotic. 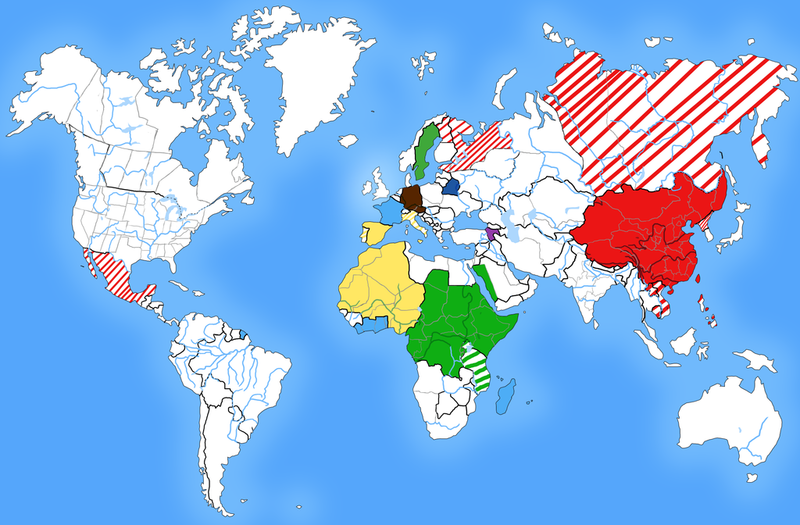 The country split into dozens of pseudo-nations, like Russia, all vying for influence, land, and power over one another. With no one really in control, Muslims and Hindu clashed. To the north though, the ever present eyes of China watched. Although hardly interested in acquiring Indian territory the situation can make them a hero and steward of stability, if they moved. For the moment, only small incursions by intelligence personnel have been made to see to the founding of loyalties in the Northern provinces. However, they have not been worked out to their full ability, and if anything China only has interests in ex-government documents and military gear (several theft missions have turned several lighter armed Sukhois over to China). Right now, all India needs is someone to give it some love and a sitar. To round off Asia there's the noble empire of Japan. Although still an Asian brute, it's been significantly weakened by the Chinese. The confusion of the Chinese Civil War had Japan harassed by many enemies, forcing its withdrawal shot and confused. A decade on, and it's found itself with one less island to call it's own, the very same Chinese who beat them on the mainland over-taking Taiwan in just over a week, quickly followed by the loss of half or Korea. Hirohito has found himself with a rival to be caution of, and with generals either angry or severely shamed. Like a wise man, the Japanese put aside their grudges for a while. During the height of the Turkish Incident - where Turkish personnel and colonists operating from small Micronesian islands invaded Papau New Guinea - China strolled to their front door to offer assistance. With terms negotiated (ceased military hostilities, the preservation of current Japanese holdings, and a general promise of non-violence between the two for at least twenty-years (spiced with China turning a blind eye on campaigns Japan may have in Thailand or Burma)) the former enemies begrudgingly set about turning aside a now common enemy. The incident was short-lived, much of the action taking place in the time-span of several days. But the conclusion taking months. The land forces on Papau New Guinea were laid to siege by naval and ground forces until they starved; on the insistence of Japan. The island bases were cleaned by Chinese and Turkish forces. Several of which were already filled to the brim with C-4 explosives (the first of these blasts taking a landing party off-guard, killing several thousand Chinese and Japanese forces). Still, Japan's holds hold and they occupy much of mainland Japan and the hundreds of small Pacific Islands from Polynesia to Papau New Guinea. It's Imperial forces are built on hard-hammered beliefs of honor and national pride. They're likely to have the second-largest fighting force in the Asian sphere. Members of the Imperial government urge caution when dealing with China, as its vast fighting force and natural resources have recently proved it to be a more than competitive opponent for Japan. Instead, there are softer targets to the south. And should the Empire shrug away all threats from the British crown Australia can be viewed as a rich treasure-trove. The ASB is made up of any variety of states who�ve pledged their allegiance to China and sought its protection politically and economically. They are in service to China and each other. These nations include Cambodia, Laos, Vietnam, Eastern Russia, Novgorod, North Korea, and the Republic of Luzon. Respectively their leaders are: Prince Sihanouk, Kaysone Phomvihane, Truong Sihn Shon (successor of former Vietnamese president Jeng Chou Mihn), Nikolov Nitski, [Father] Radek, Kim-Il Sung, and Jejomar Cornora. Members of the Asian Socialist Bloc are allowed equal trade between each member state. Member states are also expected to commit troops to any cause any one of their comrade states are wrapped up in. Emergency conferences may be called to determine the Bloc's stand on any international affairs where one or more states are unwilling to commit soldiers to, during which they will discuss and vote on their stance as a whole. Being the largest and core member of the Asian Socialist Bloc, it is silently known that China holds special veto powers; although it has yet to exercise this. Long occupied by Russian, the Finns have made several attempts at freedom over the course modern history. First there was the Finnish Separatist movement, a short-lived rebel movement that saw itself end violently at the hands of the Tsar's armies. However, their killings were not thorough enough and the two leaders of the rebellion slipped free. On the lamb throughout the late fall and most of the winter of 1970 and 1971 these two now nameless men skulked about Russia bent on Revenge. Their mission would reach its climax in early 1971. The moment was right for them then. Armed with stolen weapons they snuck into a public speech the Tzar himself was making to the country in Moscow. Earlier that year they had killed the Tzar's one and only [pregnant] daughter, effectively removing any future chances for anyone to replace Russia's monarch. As the speech commenced, the stage was rocked horribly. One of the two assassins, armed with a grenade, ran up to the stage. The resulting explosion ripping him apart and injuring the Tzar as well as distracting his guards long enough for his partner to put off a pair of shots into the man, killing him. This marked the Russian Tzardoms end, and closed this chapter on Finland's history. The last man was eventually discovered and imprisoned, dieing in a Moscovite prison in the later years. With the end of this era came a new chance for Finland to prove itself an independent state, for later in 1971 a new rebellion would emerge. Lead by charismatic Frihet-Kampe Sven, a socialist movement would spark to life in the northern reaches of Finland. Disgruntled by being ruled by a relic of the Tzarist regime, Sven mustered a fighting force to combat the Boyars in Helinski. Their march was swift, and in several months they had successfully driven the Finnish Boyars from the mainland, driving them onto a small island off the coast to the west. Frihet-Kampe Sven wishes to repeat his victory in Finland all across the north, utilizing chapters of his movement in Norway, Sweden, Scotland, Iceland, and possibly even Greenland (although unconfirmed). Too do so, he seeked to unite Finland a second time. His victory did not go unnoticed and his victory over Helinski greatly threatened Spain's anti-communist bubble they had built around Europe. They simply could not tolerate their presence and immediately declared war, quickly mobilizing their air-force in Northern Italy to bomb southern Finland, while the navy moved in position to make further bombing runs and drop special forces. The response of this declaration came from all directions. In China, the response was to send aid. Considering the troops they had in a mid-winters Russia (and no one marches across Russia in the winter) support by land or air was out of the question (air as there was little the Chinese had that could fly that far and back in one go). So, it was commanded that the Bohai and its guard, commended by Commodore Shen Shao would strike west and pick apart the Spanish offensive from under the water. In North America, the NWC pledged their support, and immediately sent troops to allied Britain from to Finland. From Africa, the Ethiopian government feared the war would spark a second Great War and immediately called for a summit between all relevant nations. The whole ASB (Minus East-Russia, Radek's Novogorod, and North Korea), the NWC, Spain, Finland, and the Ukraine came to the attendance. Negotiations were sticky, and there was much delay while the fighting continued in Finland. Finally terms were reached, but not without a massive loss for the Spanish. Unmarked, non-talking, and silent came the Chinese. Slipping into Finnish waters without raising a warning the Bohai and its guard of six met the Spanish aircraft carrier La Vanguardia. Opening their torpedoes, they rendered the Spanish flag-ship into a broken twisted mass of metal. It was an explosive two-minutes, with torpedoes launched one by one. La Vanguardia sank, killing much of her crew in the fires that burned in the engine room, and condemning the rest to the frigid Baltic waters. Further reasons to call off the war came when the same craft, on their way back to China having come close to the end of their short tour met with the NWC, Finland bound by the sea. The sub fleet sentenced the last of the ships to the bottom of the sea. Shen Shao volunteered the Bohai to linger, having more than enough fuel to stick around. The rest of the sub fleet returned to China, while the Bohai itself sunk several more logistics ships. By this time the involved forces began investing massive amounts of resources to hunting this unmarked and flag-less craft that was destroying their ships, but the Bohai snuck away without a sound. Fearing more losses, it was agreed that Finland would be split in two. Sven hesitantly agreed to letting the conservative imperials back into Southern Finland to restore their throne in Helinski. Miguel Tejero was the latest in Spain's long-line of conservative leaders. Since the 1950's the Conservative Party had maintained a stranglehold on the Iberian Nation's politics and its colonies in north-west Africa. Many avenues of the spread of leftist, communist thought have been banned from the country, such as Karl Marx's communist manifesto. It was indeed a shining example of conservative thought in Europe. It's beginning moves in the seventies had been to seek the annexation of effectively creating what they called the "Iberian League". Their road to forced-annexation was one wrought by shadows and masks, special agents at one point storming the Portuguese parliament disguised as communists, raising the flag of Portugal�s' own communists. A special task-force was sent in by request of the Portuguese to clean out the perceived communists. With this move finished, they claimed that if Portugal were to be free of the Red Menace they should join them. Their next step to securing a higher position on the anti-communist pedestal was to ally with Turkey. In doing so they joined the Central Eurasian League. The move had them gifted with land in Northern Italy and a small corner of Libya (these territories being formerly French, but through political maneuvering were ceded to Spain by Turkey). Their African holdings were used primarily for the exploration of, and acquisition of oil. The supplies they found in south-west Libya and the Sahara were enough to make the country independent of oil-producing nations. In Italy, a man named Aurelio Batista was appointed as governor. He resided in Milan, and from there conducted his corresponding agenda with the Spanish. The Spanish would launch various reconnaissance missions to the East in order to check on the front in East-Russia to assure that it had not yet breached their large security bubble. When it was finally breached by the Finnish in 1971 they reacted violently. Nearly as soon as the news hit the airwaves the Spanish government was at war within a week. Mobilizing La Vangardia and long-range bombers from Italy they attacked the new communist Finns. But the war wouldn't end well, and the special "Cazadore" agents they inserted into Finland to kill Sven were recalled. With the sinking of La Vangardia and the crippling of Spanish operations in the region they were forced to recall their troops and sign the compromise in Ethiopia. This loss would cause great unrest in Spain and ultimately topple the Conservative Party and for once install the liberal "Reform" party as masters of Spain. Conservative rule was ended in 1972 when the Reform party won 60% of the seats in Spain's parliament. Mr. Tejero managed another term, but the heavy influence in government from both sides of the political aisle dead-locked government until 1974. By this year, Miquel Tejero announced his retirement and steps out of office and returned to his hometown in Pontevedra in Galicia. This predictably destabilizes the Iberian League, soon after Aurelio Batista decided to act independent of Spain, and stormed south in a violent military-take over of all of remaining Italy, both Turkish and Sovereign Italian. Batista's campaign was highly supported by conservatives, hard-liners (known as "Burros") and normal alike. This support made the Reformists powerless to stop him. By 1975 Batista controled Italy with the capture of Naples. The little island of Malta announced its departure from the league. By the elections of 1976 Portugal is threatening to excuse themselves and the Reformists are considered doomed. It would seem the Conservatives may very-well take the helm of the nation again, prompting the political return of Miquel Tejero. Although he personally has little interests in ruling the country as Prime-Minister, he fears what would happen with the army if put into the wrong hands. red the very-basics of atomic knowledge. At the end of his research he published is results in the International Journal of Science in 1974. I probably shouldn't be throwing them in here, but ­ it. After the collapse of Russia and their fuel supply Ukraine had been on a desperate march to acquire a replacement. In 1971 it successfully captured Moscow from the rebel generals that owned it, but the campaign came at a cost. Drained and running on limited fuel it simply can not go any further. Although it owns the symbolic capital of Russia, it still faces stiff competition from the battle-hardened warring-states of the Russian Remnants. Not to mention the additional threats Father Radek of Novogorod could pose should his communists push south with the breathing room given to them by the collapse of the Komi fields at the hands of China and Nikolov Nitski. Ukraine is also one of the parties responsible for the Finnish Division Treaty, due to proximity. The nation of Ukraine stands as a gritty European third-world power in a sea of other gritty East-European nations. The splintered state that was once Russia is a chaotic place. Now ruled by a menagerie of leaders ranging from former Russian army officers to the aristocratic Boyars who now claim the title of Tzar it's not a peaceful place. Indeed, in this world it is the India of the North. No peace exists here, and communist and conservative clash for control of the far north-land. The Empire or Tzar Peter IV was a relic of a time long-passed. Saved from communism by an early withdrawal of troops from the Great War it managed to linger as a total monarchy. In contrast to the former Tzar - Nicholas II - Peter's reign was far more interested in expanding its influence. It never got far though. What it thought was a squashed defeat of rebellion in Finland proved to be the last bite a dying wolf gives a foolish and proud hunter. So with a reign of blood and fire during a cold winter's afternoon it was brought to an end. Now Russia is divided. Squabbling and diseased pseudo-nations in the west, and a unified Communist wolf in the east. At some point, all of Russia will meet in the middle, and all of Russia will be returned to its former state again. It may take years, decades maybe centuries, but everyone wishes for the sweet taste of it all. Less a nation, and more an event. This war is being detailed as it's important for anyone who potentially wishes to play as France or Germany, and also explores the collapse of the Central Eurasian League. None of the two nations involved were very important, but together they caused a might fine impact. The War began with an impromptu invasion of Germany from France. The first move was the invasion of the city of Wurm. Germany responded by mobilizing its home-based troops to the west of the country and struck back. The German forces made a short campaign in Belgium in order to get close to Paris. Germany pleaded with the head of CEL to condemn France and send aid, but French agents in Istanbul assassinated the ambassador and cut off Germany's attempts to get Turkey's attention. The Prime-minister made the plight known on the public air-waves, but no support was sent, or action taken against anyone. The inability or desire of CEL nations to get involved proved that the alliance was indeed dead. Quickly though, the war stagnated and for two years the front didn't budge. Trapped in the ideas of the Great War they waited each other out in trenches before declaring a cease-fire in 1973. Ruled by Sultan Suleiman, Turkey (or rather, the Ottoman Empire) maintained a very expansionistic operation. Since the mid-60's they had issues with Egypt over the Suez Canal. As tensions rose they finally broke into an all-out invasion by the later half of 1970. In addition they marched on Italy and claimed everything from the Alps on down to Rome as their own. It was little known among the general population of the Turkish people, but Suleiman was a devote and observant Orthodox Christian. As such, he nurtured the church to be the nation's majority religion, with Islam in second. Despite his spiritual leanings he still commanded the abilities of his Muslim seat. The war on Egypt - for example - was considered a Jihad. To spread their influence Turkey spread their influence under the table by sponsoring pro-democratic movements in Iraq and other neighboring states to overthrow the power in place and plant pro-Turkish leaders in those nations. Turkey was also the founding member of CEL and recruited France, Germany, Saudi Arabia, the RNF, and Spain. It's original intention was to combat the threat of Russia in the north and to prepare for a feared second Great War. But short-time proved that the alliance was ineffective. Shortly after their invasion of New Guinea the Turkish government slowly became more isolated. It withdrew itself from the world, allowing Persian, Ethiopian, and Indian expansion in Saudi Arabia. It failed to react to the spread of Chinese Communism in the East. Suleiman mysteriously became more reclusive. It could be suspected that it was due to the Franco-German war that shook his resolve, and soon afterwords the conquest of Italy by Batista. As the 70's dragged on to 1976, Turkey lost its strength and the resources it commanded. Now it holds only those lands directly occupied by it's army, although barely. Egypt could very well spring into action as Turkey suffers economic instability after the loss of near-direct control of Saudi oil. It faces stiff competition from the stronger Shah of Persia. Greece even could declare itself independent of Turkey and break itself free. The only lands it controls ranges from Anatolia itself down through the Levant. It only gets weaker into North Africa, with Libya being at the very fringes of Turkish control, and on the border of them and Spain. Saudi Arabia is no more. After the collapse of India the lands they occupied became empty and power-less. So it was expected that the former forces that held Saudi Arabia together would fill in the vacuum. But without the Saudi family present to call Arabia Saudi Arabia it had to be named something else. So thus, it is now the Kingdom of Najd. After the invasion of the Persians, Indians, and Ethiopians the Saudi family lost power both spiritually and economic. The combined effects of loosing their oil fields and the holy centers of Islam shattered their influence. Their defense against the Hindus only served as a final blow. Dispelled and broken up, the Saudi family no longer holds power. Instead, former government officers and tribes of Bedouin rule collectively over the region historically known as the Kingdom of Najd. But with only the former capital of Riyadh to call their own they lack any real power. In fact, it largely serves as a political buffer between Ethiopian Arabia and Persian Arabia. The greatest resource this land can provide is sand and rock. Indeed, like Ukraine Najd is a gritty third-world nation. Hell, maybe even below that. It's a place ready to be conquered. Or for a wise leader to claim victory. The jewel of the Middle-East. Although still ruled by the archaic shahdom, the royal family now rules liberally and with great power. Now the largest oil producer in the world after the fall of Saudi Oil it can only be described as a tank. But it's also a mixing bowl. There are talks of communism in the cities, and the religious leaders in the back-water parts of the country would see a more conservative and religious rule. Still, the current Shah has great power. In 1971 he convinced the Mullahs to accept the liberalization of women's rights. In addition many infrastructural projects were under-way across the kingdom. Several government complexes were ordered built in Tehran as well as restoration of important locations such as the Naghsh-e Jahan Square. Elsewhere, Tehran hopes to increase its industrial capabilities with the construction of factories such as an automatic plant in Esfahan. A rail system built in 1971 would better connect the cities of Tabriz, Tehran and Mashhad, and run between Esfahan and Bandar Abbas. There was also an election penned in 1971 amongst the Majlis, and later the drafting of an official constitution. Research would go in to assess Tehran's earthquake risk and decide a new city for the capital. A census would of course be taken on the population of their new Arabian claim in 1971, counting the number of people at their disposal as well as their view of Persia. New laws would also made education mandatory, and all schools would have to legally teach their children on the pre-Islamic civilizations of Iran. Iran's concerns are not all internal though, and it has great concern in international affairs. To clip Ethiopian influence in Africa, it utilized tribal and religious divides to overcome Ethiopia. In doing so it's suspected they are responsible - either directly or indirectly - of the emperor's death and of the revolution in the Congo. There is great interest in Spain's Murzug oil-fields and often infiltrates them to look for weakness (either for sabotage, invasion, inciting revolution, etc) and its output. Further investigation could very well bring to light the ethnic cleansing the Spanish performed on the native Tuareg population. Such knowledge could go a long way in condemning Spain's conservative party and bringing the country to justice. Interests in Asia apply to the whereabouts of the Shah's brother Qurom, who's a devout communist and fled to China seeking asylum (and for a while receiving jail-time for trying to get enter China despite it's strict anti-emigration and immigration policy (such a policy leading to accusations of espionage or disloyalty in the case of its citizens)). On the Arabian peninsula, agents infiltrate Yemen, causing it to become autonomous, but at the same time ensuring its leadership is Pro-Persian, turning it into a Persian satellite state. Espionage in Turkestan (sort-of-occupied by China, but not enough to influence its policies) and Afghanistan hopes to turn up the possibility of invasion or the chance of influence these nations. Persia also has interests in the formation of an oil-production bloc and his discussing such an opportunity with the NWC. Such a deal will lead them to have a near-monopoly on oil production. Persia was a critical of the invasion of Finland, accusing the Spanish and the NWC of stretching their resources too thin for such a small goal. Yet, they recognize that the prolonged existence of a communist state in the Eurozone could lead to a platform from which communism - and it's feared it could be Chinese Communism - could spring-board into Europe. But they remained in a state of no-involvement, in fear of provoking that Chinese guerrilla." Closer to home, Persia is watchfull of Turkey. Although it has become stagnant it's considered a threat to the power of Persia. A war between the two nations would throw the middle-east into chaos. Just sticking to cannon, at this point Europe has been slow. For a short period in the first RP (which was set five years previous to this one), Germany and France were at war over territory. Britain underwent decades of anarchy a decade or so previous to the start of the RP and are just now rebuilding, but have pretty much lost or are in the process of loosing all of their old colonies. Spain is the European regional power and one of the leading Super powers, with an right wing government that is in fierce opposition to the spread of communism. Italy is under control by a Spanish general who's connections with Spain have became thin, but he has been brought back into the fold with a pact between the two entities. In the east, the Turks had a strong presence in the Balkans and ran a short term alliance. Finland was under Russian control, but a pair of Finnish assassins finished the Tzar of Russia, leading to fracturing of it's empire. Communism has taken roots in several Russian territories,(Primarily the territory around St. Petersburg and in Siberia), and those factions are at war with other factions in a multisided attempt to unite Russia. The old Russian property of Finland experienced it's own communist revolution that lead to a war where a Spanish lead invasion was launched to enact a counter revolution, but the war didn't go far and eventually a peace was signed that split Finland much in the same way Korea was split after the Korean war in the real world. The Ukraine has entered the Russian conflict and currently have control over Moscow. Asia is dominated almost exclusively by the behometh that is the Asian Socialist Bloc, centered on China which is the primary asian region power and one of the leading super powers. It is the leader of the communist movement, but despite it's power it doesn't get involved in international affairs as much as the other super powers do. Japan is an NPC controlled by it's Emperor and is really the only thing in Asia that isn't communist. India is currently being united after a collapse five years ago caused by suicidal revolutionaries. The new India is following China's communist example. Australia is currently looking for trade partners. It is also home to mercenaries. The middle east is currently not in play to any major extent. The currently NPC Ottomans have control over a lot of it, though we haven't heard from them in five years. Five years ago they were a budding super power dominating the muslim world, though the Sultan was secretly christian. They put together the now defunct Central European League, but it broke down as the Turks went dormant and it's members started to war among themselves. Persia/Iran is also an NPC, which is attempting to modernize and through off European industry. Arabia has been torn apart after an invasion in 1970, which has left arabia in modern times split between Iran in the east, Najd in the center, and Ethiopia in the west. Africa has been significantly decolonized, with only the German colonies in modern day Tanzania, Zambia, Nambia, Angola, and Mozambique, the British colony on the Ivory coast, and the Spanish Saharan colonies still in European hands. The Turks also have regained possession of Egypt. South Africa is a seperate free country that, after a violent revolution five years ago, is doing well for its self. Modern day Botswana and Zimbabwe form the nation of Tswana, which is an NPC. The major regional force based in Africa is the Ethiopian Empire, which controls the center of the continent. The Ethiopian Empire is currently experiencing a civil war which has split the country between an Emperor with German and British interests in mind, and an opposing candidate to the throne supported by the people and Ethiopian military. Before the civil war, the previous Emperor's government had armed rebels in other countries and expanded as the tide of colonialism fell back, and he was notably anti-European. He was assassinated, and now the candidates are a hedonist man-boy and his younger idealistic brother. South America had a rebellion in Brazil in 1970, though where that is now I dunno. Otherwise, South America is a land dominated by players who join but never post. Sort of the bermuda triangle of precipicers. North America is by far the most complex thing. The primary super powers are the United States and the twin Canadian nations. The United States has suffered nothing but bad luck so far, having to deal with several rebellions caused by players trying to make their hometown a superpower disgruntled regions. In 1970, the lead to the nation of North Florida, which existed for about one year and spent that year at war with virtually everyone in the area, at separate times fighting the United States, both Canada's, Cuba, and Mexico. They collapsed due to malaria and reentered the union. Currently New England has newly separated from the United States, and event which seems to be sparking a continent wide war also involving Spain. The twin Canada's are Canada proper and the North Western Coalition made up of British Columbia and Alberta. The NWC was founded by a canadian player making his hometown a superpower an oil industry wanting to govern the region for itself. Canada let it go peacefully, and the two have worked more or less together on most things. Canada invaded the United States in 1970, gaining possession of Alaska out of the deal and also basically tearing the continental US to pieces. After all the trouble, the United States went communist and became the United Socialist States of America, whereas the Canada's associate with the more right wing Spain, allowing the New England separation to spark a left vs right war in North America. The United States is joined by Cuba, which is a chinese style communist nation, and Mexico which is an America style communist nation. Well ladies now that I got you to read that, applications times. Just copy this form, delete the ********, and fill out. Nation/Faction- If you're gonna play as Germany, enter Germany. See, that wasn't so hard. However, if you're going to play as a rebel/separatist faction, enter the name of your faction. For example, if you're playing as the made-up Liberation Army of Andalusia within Spain, put Liberation Army of Andalusia (Spain) to show that your faction is operating within Spain. You may also include more than one nation that your faction is operating within. Faction Type- If rebel or organization, fill this out. If not, just leave blank or remove all-toghether. Backstory/Bio- Here you can make up the history of your nation or faction after 1914 up to 1976. Include any wars or rebellions that may have taken place. It helps to actually know a bit about the country or region you're playing as/within so it might not hurt to learn a little about your country's history on the internet. God forbid you might learn something once in a while. Also, it's best to familiarize yourself with any of the respected nations in the region. Any other information you want to share should go here. And I want a long bit of writing here. Three to four paragraphs or more of information. If you're short, I'm stopping you there). Because I reeled in a few of the vets from the old forum and convinced them to follow me this is included. Simply say hello, I should know who you are. If you want to be sure and to test my lovely memory, state your old username and tell me what we should do about Canada. There's no app for this. I'll add them as they come around in the RP and we don't need to worry about technicalities. If you can supply a flag too, that'll be great. I swear to bloody good, if you fill this out thinking it's the application I'm going to kill you. Fact sheets are purely optional and are here to keep a reference on the status of your nation ranging from population to economy and army composition. Also comes with a brief history. I am expecting that anyone filling this out does some hard research on their nation of choice. Look into their population in the seventies to get the population now, as well as calculate army size (these numbers may be altered slightly to reflect anything the country has done to affect it, either through war or population control programs). By filling one out, you'll be making yourself aware of you nation's strengths, weaknesses, and everything else. If you have any questions on if your nation's history works with the RP's canon thus far, shoot me a message and I'll tell you all you need to know. Of course, it'll also need to work with it, so no Venezuela intervening in the Finnish Situation. The preferred reference is the CIA fact book. In fact, the fact sheet is structured much like the CIA fact book. Area (comparative)-compared to other countries, how big is yours? Maritime Claims-how far out to sea does your territory extend? Military Service Age and Requirements- Have conscription? How old do you have to be to enlist? Naval Size (if applicable)- many ships and what kind? Save for China, there will only be links to the pages on which a fact-sheet may be found. Map- Big map is big. The NPC party has held onto control of China for ten years. After years of peaceful-turned-bloody revolution the New People's China had finally overthrown the old Dynastic powers. The reign of Manchuri based Aisin-Gioro Puyi had come to a crashing end in Beijing. The Emperor's reign, who had long been supported by Western peoples after the Great War was at its climatic, story book ending. Having seized the hearts and minds of the disgruntled working population revolutionary Brother Hou Sai Tang led the forces of all China combined. Emperor Puyi had held power during his child-hood. It was during this time that the boy-king had no political power of his own and those acting as regents had signed the nation over to become a republic. This in turn opening the flood-gates to the many old warlords of China who fought over and conducted many coups upon themselves to gain power. The combating stopped when nationalist Chiang Kai Shek took office. Shortly thereafter came the Japanese invasions and the People's unrest in the early to late 30's early 40's. It was in the midst of the Japanese invasion that the exiled emperor Puyi returned with his gathered support to reclaim the throne. It was also here the Chinese Communist Party - what would soon become New People's China - came into being. The result being a massive and complex civil-war. By the mid 40's Puyi had claimed the throne. The Japanese had since had their numbers in China beaten out by the multitude of armed and aggressive enemies and had let go of many of their claims on main-land China. Over the course of the late 40's Puyi worked to re-obtain lost Chinese land. But through this short period the Chinese Communist Party feared that the emperor was working for the Japanese and turning China into a puppet state. Combined with their party effectively being out-lawed and the loss of representation unrest grew. In the shadows of government shrewd dealings meant to strengthen China were beginning to weaken the country. The people had been long starved to support a government that had been long weakened; much of its attention being diverted to dealings with the Japanese. And it was only devastated with the withdrawal of western support and aid. The highly dependent old power was without a shoulder to lean on. It collapsed under its wait and resorted to more taxes and other forms of proletariat repression to make ends meet. Suffering from this pressure, the lower and working classes rapidly grew disgruntled. They craved for a leader to call their own. But the CCP was in its own rite broken. This is when Hou Sai Tang stepped in. A lawyer in training at the University of Hong Kong (handed over to the Chinese by the British) he soon find himself in possession of and reading Karl Marx's Communist Manifesto. Inspired by the words in the book and the romantically failed efforts of revolutionaries of the likes of Vladimir Ilyich Lenin he sprung into action. Immediately he proved an educated, charismatic, and powerful political leader. 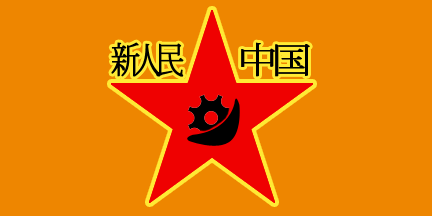 One-by-one the fractured Chinese revolutionary groups pledged their allegiance to, and ultimately joined Hou Sai Tang's "NPC" party. In his early 40's the man was already a beacon of national salvation. In the summer of '55 the revolution turned bloody. Imperial soldiers surrounded and gunned down a group of student protesters in the city of Tianjin, south-west of Beijing. The revolution was spurred into rage and many of the revolutionaries countered with equal or greater violence. Fire-bombings of police stations and slayings of any Imperial Soldiers they could get their hands on was a common occurrence. The murder rate during this period quadrupled and it soon adopted the name "Summer of the Red Tide". Hou tried to calm the revolutionaries, telling them violence is not the answer. However he too fell to violence when his own brother was shot on the street for wearing the symbol of New China; an orange arm band with a big, red star. Guided by the former officers that had been drawn close to him Hou was able to organize and rally his supporters. Upon organizing the revolution into a military endeavor a series of guerrilla operations were conducted. Four years of bitter following ensued before the Imperial Forces were summoned to defend Beijing itself. All of China was red now, save for that crucial city. Spurred by around the clock pro-revolutionary propaganda spouted from the gullets of boisterous supporters, megaphone, and loud speaker the armed militants closed in around Beijing, killing every man who raised a gun at them. The Forbidden city was soon surrounded and a several month long siege commenced. It was an unusually quiet operation. Bent more on starving the old regime out as opposed to burning them alive. In September of '59 the emperor finally surrendered. At the word of the surrender the army burst into the palace and jubilation erupted as the last Imperial-held ground finally belonged to them, to the people. The Emperor and his last supporters were taken to a re-education prison in the middle of Qinghai province. Word of his well-being has not leaked out to the people. No man has yet heard of Puyi, many are beginning to forget. Those who do say he is surely dead, beaten as a final act of rage. Hou Sai Tang now sits at the head of the government. Before him a grouping of representatives from all over China, all pro revolution, all pro him. The minds of the government plan and discuss how to keep the revolutionary spirit strong, whilst bringing the tales of glory, and riches that have brought them and the people of China. Since taking power many of the country's politics have been geared toward the inside. Early legislation such as the Fair Wealth Initiative gave ownership of the old companies to the government who tightly controlled what and how much of a product they produced, never to fall below how much they needed or above. The Opium Liberation Laws also laid down the regime's strict and clear stance on drugs, being that any comrade caught ingesting, distributing, selling, or growing narcotics is liable to penalty of death. Enforcement of this law is largely carried out by the Intelligence Bureau who is charged with the capture and total destruction of all crops. Profits seized in their operations go straight back into funding their war. Other early acts include the National Repair program which set to fix the damages to industrial, public, and residential infrastructure committed over the course of the revolution. The plan ran for several years, and had restored all of - if not slightly less - the damages committed. An agricultural repair plan was later put into effect in early 1970. The military was also bolstered by the People's Recruitment Drive which increased eligibility for civilians wishing to join the armed forces. I also increased their access to recruitment depots with more recruitment centers being set up across the country. As an effect manufacture of military products had to be increased and many more factories built or converted to the production of weapons and munitions. Since 1970 the interests of the party had entered a "awakened" state and marched into Tibet, forcing it to surrender in several days. Further acquisitions have been made on Taiwan in the later part of the 70's. Nurturing of communist sympathies have spawned rebellions in Indochina, North Korea, and East Russia: lying out the core members of the Asian Socialist Bloc. The Republic of Luzon would be made its latest member in late 1971. Military programs have been under way since 1970/1971 that encouraged the expansion of rocket technology. Although these rockets have largely been utilized to launch weather satellite like OARP 1 and 2 (made public to greater China in 1974). Rockets are also being used as a main component in the High Altitude Bomber project. Hou Sai Tang � Grand secretary and chairman of the New People�s China party. Holds the highest power in government. But must still act within yearly party budgeting. Mang Xhu � Minister of people�s affairs and premier. Acts as head of state when Hou is on international business. Otherwise holds authority over infrastructure and media. Mao Zedong (shamed, deceased) - Elderly minister of economics. Purged and executed in 1971 on charges of sedition, organizing and running an illegal operation, prostitution, and opium use and distribution. Aisin-Gioro Puyi (deceased) - The forgiven Emperor. Held the office for two-years before passing away from liver cancer. Responsible for the completion of the agricultural reconstruction as started by Mao a year previous. Zhang Auyi - Acting minister of agriculture and economics. Pushing for agricultural reform in his vision of mechanization. Wen Xiogang - Secretary of Parliament/Politburo. Wen Daohang - Chief executive of the National People's News. Lin Diaobe - Engineer, working on the project to return auto-mobiles to China. - The expulsion of non-traditional elements in order to nurture a revival of cultural ideals and national identity. - The expulsion of leeching religious institutions (Christianity) to prevent an unfair spread of wealth and cut the head off of the religious-bourgeoisie class. - All private industry is to be owned by the state which shall act as the representative of the people in manufacturing and industrial affairs. - The state should see to proper distribution of wealth, seeing fit to buy and sell as it sees the country to need. The state reserves the right to administer roles to the population on a regular basis. - The military should act not only as warriors, but of the suited representatives of the state. Their well being and discipline protecting and serving national and current ideals. They recognize the people as those they serve, and the state as being the people's representative. Deviation and disobedience is highly discouraged as it threatens the safety of the people and their nation. Deviants at arms are subject to rank-stripping, expulsion, or re-education/rehabilitated. - The Re-educated/rehabilitated may never join the army. - Centers of rehabilitation must not make their soul purpose punishment. They should seek to make aware of its inmates their wrongs on a daily basis. Once their psychological barriers are weakened they must be reconstructed as deemed fit by the state into "fine upstanding comrades". Only until they gain the trust of people may they re-join the people as full citizens. - It is the state's job to appoint fitting roles for the rehabilitation. - Rehabilitation involves: political deviants not purged, Prisoners of Wars, foreign spies (when not killed). - In the air of competitiveness the nation's universities are allowed to remain public. The government shall only own a 10% share of the individual universities. - A politburo/parliamentary election is to be called every five years to determine and refreshing of seats. - Former members of the state politburo and parliament may serve as many terms as they see fit. But must skip a term to give up their seat to someone else. Seniority will only serve to lengthen the period of wait between election appointment. ~ If the chairman chooses he may leave the picking up to a vote in parliament. - The Secretary of Parliament is allowed to skip the period of wait. His remaining in this position is subject to vote or approval by the chairman. - These parameters only apply to Asia, but may be extended to the whole of Oceania and mid-Eurasia. - National colors should involve Red. - National symbol should subscribe to a symbol of the working class. - Promotions must be reviewed by state representatives. - Shedding of these bounds may occur when the State feels it has repaired and revived Chinese sovereignty and it is again at a new golden age. Maritime Claims- Claims on waters as far east as the Philippine Sea. Climate- Varies. Tropical south to sub-artic north. Other- Army side-arms include: Changhu revolver pistol with .520 Changhu rounds, ten inch combat knifet/bayonet combination. Soldiers carrying the Degtyaryov machine gun are often armored with combination chain-mail and sand-bag padding under or over their uniforms to protect themselves against light-weapons fire or to soften sub-machine gun fire. At least, so they hope. Riflemen are also equipped with a short-range gas-canister launcher that can be snapped onto their weapon like a bayonet. The small attachment can launch cannisters of debilitating tear gas or deadly mustard gas over obstacles or into buildings. Due to this equipment rifle-men commonly carry gas-masks and additional ones issued to soldiers travelling in the company of rifle-men. Naval Size (if applicable)- Four Shandong-class battleships, sixty Beijing class Destroyers, twenty Sea Dragon cruisers, and two 1950's D�p�ngxi� class air-craft carriers who mostly patrol the waters between Japan and China. In addition, in order to rival the Japanese presence the Chinese navy is in possession of twenty submarines of varying classes (Seven light "Kelp" SL-400s, three supply subs, two heavy SH-360 class subs, and six "shallow water" landing submarines) including two Chinese variant of the Japanese I-400 (large under-water aircraft carriers with world-circumventing potential): the NPS Bohai and NPS Dalain. - The "CSI-400" series is a young series in that it hasn't been fleshed out very well. Air Force Size (if applicable)- three-thousand mixed fighters and bombers. Ethiopia (or you know, third post on this page). Maritime Claims-Control of Red Sea south of Egypt, claims 100 miles out to sea from coasts. Terrain-Sand Scrublands in Ethiopia and southern Sudan, Desert in Northern Sudan, Jungle and Forest in the Congo. Natural Hazards-Deserts in Sudan, Earthquakes throughout territory, some risk of Volcanoes in Ethiopia itself. Major cities by populationAddis Ababa, Khartoum, Kinshasha, Djibouti, Mogadishu, Mecca, Jeddah. States/Provinces- Ethiopia, Somalia, Hejaz, Sudan, Uganda, and Kenya. -StG 44 with 7.92x33 Kurz Cartridge (most used assault rifle), -Steyr AUG with 9x19mm Parabellum cartridge. (Less common assault rifle due to limited availability, used mostly by home guards and elite forces). -MG 34 Machine Gun with 7.62x51mm cartridge. -Walther P38 Pistol with 9x19mm Parabellum cartridge. -ARMY:Lizard pattern cammo, brown/olive green for Ethiopian troops. Brown berets standard issue, but usually only worn in formal circumstances. -NAVY: Navy blue fatigues with blue beret. -AIRFORCE: Same as army but with red beret. -WALINZI: Black greatcoat modified to hold optimum amount of weapons and ammo, black sunglasses, black beret. Very commonly undercover. Military Service Age and Requirements- Government has the right to conscription but rarely uses it, wartime conscription only used when necessary. 16-40 is military age in Ethiopia. --15 C-130's, belonging to the navy for aerial transportation. --Stanley Barnham, AKA "Sheik of Cairo"
-African Crime Kingpin (Based in Malabo): "The Belgian Man"
Anyway have fun being topichitler. Well I am very interested in this alternative history RP, from what I've seen it looks like technology is from the 1920s, science is from 1890s and society is... somewhere. Well as I'm unsure as to how things will pan out and I'm what you call 'an up-start', I'd like to play as the Spanish colonial possession of Mauretania. Thus leaving all foreign and military affairs with my colonial master :tongue.gif:. Quick question, when you say "Story-written narrative, dialogue, and all of that. ", what perspectives are you looking for? Am I meant to be a leader or reporting my actions through a newspaper or chit-chat between a couple of people? Also are we allowed to fill in a few historical & political blanks or is everything set in stone? I don't think Spain's former master will mind if you're going by his will. That is if he stops being dead enough to float over here. But it's finals time, so I imagine when he's done with that he'll join us. And I've made us of many different devices and characters to look at what's going on. You don't necessarily have to be your leader. I've invented several lieutenants, generals, field officers, and celebrities to explore my version of China. As well as writing up mock news paper and radio reports. All I want to see is something creative. All the posts I've seen in RPs like this really make my spine crawl. They're too flat. As per technology and stuff, it's all over the board. Minus computer targeting systems we got semi-modern jets. It's something that could be contested, but they're so much a thing now for the RP it's not worth it. And Vilage, Arnie. Good to have you back on the crew. I'll get your nations colored in with their new shiny colors and we'll be off. Be careful, admins don't take likely to this posting. And there you go, you're your own double rainbow across Canada. Canada will become one with America yes? Canada is soooooo going down by the end of the first week. Why is Canada a Rainbow? Well, I did come from the other thread, but seeing how I completely wrecked India, I feel like starting anew. Silly terrorists. Faction Type- The UFI is a terrorist cell formed shortly after India collapsed under its own weight. It seeks to restore the complete Indian republic: Sri Lanka, India, Burma, and Pakistan, all under one unanimous rule. Backstory/Bio- The UFI was formed before the Parliament was assassinated. Mahatma used to be a member of Parliament, going by a different name at the time. Seeing the collapse of mother India before his eyes, he fled the country mere days before the bombs went off and killed Parliament. Once India had devolved into complete anarchism, he convinced millions of citizens that the unholy had tried to destroy their great nation. But, under his guidance, the pride of the nation could be restored once more. He changed his name to Mahatma Sarvodaya- Mahatma meaning saint, and Sarvodaya, meaning progress for all. Soon, however, India rose from the ashes as a collection of disorganized, angry states. Figuring one had to be loyal to his cause, Mahatma went to each government, pleading them for assistance. Only Jaipur's accepted. The communist structure of their government (which I am going to need as a plot device, sorry person who claims this country) was very stable economically. Though the government is not directly affiliated with the faction, a few generous donations have saved them more than once. The main base of military and political operations is centered in Jaipur, near the outskirts of one of the larger towns. With the world stirring once more, Mahatma finds himself once again struggling for power. India has been apart for five long years, and while the UFI has been active, it hasn't been enough to unite mother India once more. The time is ripe, with the nations of the world stirring. Maps are going to be burned and redrawn soon. Why not start in southern Asia? Not as long a post as I would have liked, but being a 'new' player in the turn of events here, I don't have much to put down. Everything about the Indian descent into anarchism's in the old thread. Well now you can start afresh, so long as you're not playing out the renewal of India in the time-span of a week. And your Sukhois are [mostly] China's now. Of course I'm not reviving India in one week. But, seeing as this is a fantastic roleplay on one of the largest online forums, I may have no choice but to make it less than a month. Why so aggressive, it has been five years, and I believe my act has been quite an improvement, no anti-US, which can't be said for you. Burn in hell you hockey-lover.